1927 - The first cookies are sold in Regina, Saskatchewan. 1929 - GGC starts selling cookies across the country. 2018 - New cookie box design is introduced for both sandwich and mint cookies. May 31, 2019 We will need the mint cookie orders by this date, and before you close up for the summer. There is a supply of the rockers, and main crests at the office. If you have a business that likes to help you out with the cookies, you can get a certificate from Provincial to submit to them as a token of appreciation. A very nice way to say Thank you. Help us to spread the word and remind Units to use the Cookie Finder Map application to promote their group cookie selling event. There was a significant increase in listings for a couple of provinces during the Mint campaign but we are still a long way from optimum usage. It is important that the map is populated with sales across the country if we are going to use it as an effective tool to match Units with an eager buying public. The map and event form are located on the main website here. The map is now the first point of reference given to all inquiries regarding where to buy cookies and is promoted extensively through our social media presence. The Twitter account @girlguidecookie will be monitored and live over the weekends of the campaign to optimize the contact with customers. Don’t forget to remind Guiders that the site saves an ongoing Unit event history that will keep a record of past group sales locations for the Unit. This means that if a Unit repeatedly uses the same venues for campaign group sales all they need to do is update the date and time, then resubmit the event for approval. No need to start from scratch with each event. The site also has the ability to load multiple dates for the one location to make it easier for Units to register their events on the map. Plan your cookie selling event. This can either be at a local retail outlet, door to door or other selling opportunity like a "Cookie Drive-thru". Once you have arranged for all approvals, log your event on the Cookie Finder Map. Use the sales event form and make sure you include the correct postal code. Events can be loaded on the Cookie Finder map as soon as you have details but must be loaded at least 24 hours prior to the Cookie Days in Canada event to qualify for the crest. If your event falls on the Cookie Days in Canada weekend, then you will receive an automated email asking for your mailing address. Fill this out and a cookie banner will be sent to you approximately 1 week prior to Cookie Days in Canada. Once the event weekend is over, you will be contacted to fill in a short survey about the event. This survey will contain the information required to order badges. Girl Guides of Canada has decided to terminate the relationship with SmartCentres due to problems with site placement and concerns with outdoor selling locations. We are continuing to reach out to potential partners, both national and regional, but for now will continue with the limited selection of RioCan properties that we have been working with for the past year. Use this site only if you wish to sell at a national partner location. All other events should be loaded on the Cookie Finder Map to take part. This site will open at 12 noon EST on Saturday, February 9 and close at midnight EST Sunday, March 24, 2019. Bookings are allocated on first come, first served basis. Fill in your unit and contact information including address (for the cookie selling banner). Choose the RioCan location that you wish to book. You can make multiple requests, but the will be allocated one at a time on your preferred basis. Choose your preferred day – Saturday or Sunday. Select your first-choice time slot. Click on 2nd Choice to register an alternate time in case your first choice has already been taken. Indicate if you would like to be considered for an additional time slot. Time slots are two-hour blocks to allow as many units as possible to take part in this initiative. However, if times are still available after the booking site closes they will be offered to units that have already booked. If you have any special request/information, include that in the text box, then click on the SUBMIT button. You will receive an automated reply to indicate that your form has been forwarded to the National Office for processing. Please do not contact the RioCan mall management directly to book space for this weekend, as bookings have been centrally coordinated to ensure that as many units as possible can participate in this excellent group sales opportunity. Any unit booking directly will be asked to resubmit their request through the online system. Stores have been asked to give priority to those bookings coordinated by National Office. This important selling event in the campaign calendar will be held on the weekend of April 6 and 7 this year. Cookie Days in Canada event will concentrate on the format that allows Units to take part in the event by organizing their own selling event on that weekend, whether that be in a local store or even door to door or Units. There will still be limited ability to book space for the event with RIOCAN properties however these locations are only available in a few provinces and are all indoor sites in malls. A list of RioCan properties is on the Cookie Days section of Member Zone. Units can either list their own self organized event on the Cookie Finder map or use the National booking site for RioCan properties. This site will open on Saturday, February 9, and will remain open until midnight EST Sunday, March 24, 2019. The link for the national booking site is here. The information on how to take part will have a story and link in Guidepost and we would appreciate it if you could distribute the information via your provincial channels as well. The DIY group event option can be loaded on the Cookie Finder map at any time up to 24hours prior to the Cookie Days event. All information about Cookie Days is available on the Cookie Day pages on Member Zone. Any Unit that registers their event on the Cookie Finder Map for the weekend of April 6 and 7 will receive a confirmation email with a link to include their mailing information so that they may receive the PVC cookie banner. We will also continue to offer a Cookie Days in Canada crest to all Units that log their event on the map and fill in a short follow-up once the weekend is complete. We will continue our successful promotional campaign via social media with Facebook/Instagram advertisements. 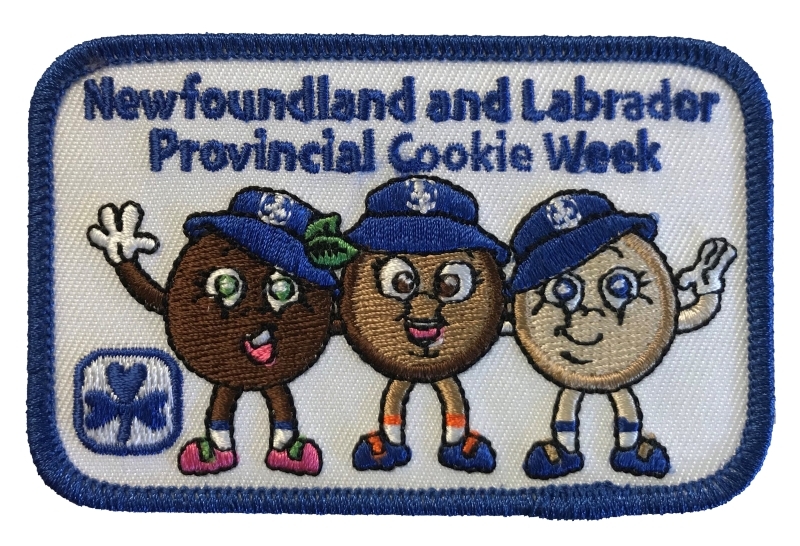 Our aim is to have as many Units as possible taking part in the Cookie Days in Canada weekend in whatever way is easiest for them. Let’s work together to promote this initiative and ensure its ongoing success. Cookies will be delivered the week of March 18-22, 2019. They should be calling/emailing to set up delivery times that is convenient for you. ** When signing the POD they need to be sure to sign BOTH copies of the POD – theirs and the driver’s. (1) The signed POD is the transfer of responsibility from Dare Foods to Girl Guides therefore if the driver is using an electronic device to obtain signature for delivery, Guiders need to ask for a print out of the PODs or sign the packing slip attached with the delivery. Any necessary notation in case of dam-ages should be done on the packing slip, driver needs to sign Guider’s copy. b) Not to discard their copy of the POD after delivery. Copy of their POD should be kept in a safe place until after the invoicing process is complete. Units will notice some changes with the 2019 classic cookie. We are continuing our rollout of the up-dated packaging for Girl Guide cookies. Using the same design elements that were introduced in fall 2018 there are 8 dynamic images to be found on the cookie boxes. The images showcase the many benefits of Girl Guides in spring and summer settings while following the basic design trends introduced with the mint cookie packaging. 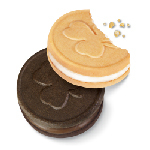 The classic cookie also sees a revamp with a new ‘stamp’ featuring the updated trefoil design. An exciting new element being introduced this campaign is that with the move to all-natural flavoring and colouring we have been able to extend the freshness guarantee to 10 months, thus allowing the cookie to continue to be sold over the summer and into the start of the next campaign. The mint freshness guarantee date remains at 8 months. Cookie All Stars registration site will open for all units on the first Monday in February 5, 2019 after cookie ordering period is finished. Passwords that Guiders established in the past for the CAS site are still valid.